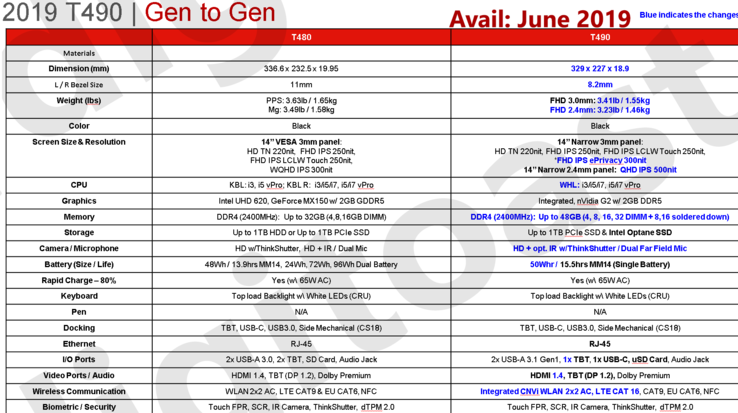 Lenovo's ThinkPad division gets hit by another leak, as a reddit user has published data-sheets for most of the upcoming ThinkPad business laptops. Though there is no way to verify the specs at this point, the specs of the T490 do line up with the already announced special T490 Healthcare Edition. Not long after a roadmap of the upcoming T series was leaked, another huge leak occured. This time, the data-sheets of most of the ThinkPad 2019 lineup were leaked by a user on the ThinkPad-subreddit. 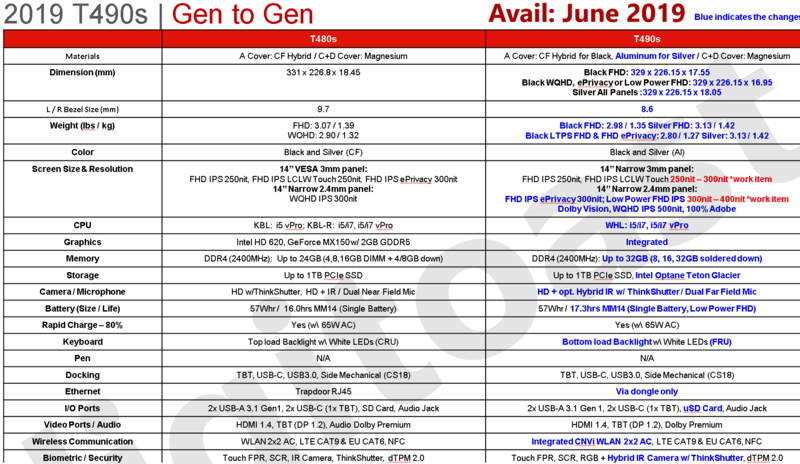 The core of this leak are the data-sheets of the new ThinkPad T series with Intel processors, namely the ThinkPad T490, the ThinkPad T490s and the ThinkPad T590 (as well as its workstation-brother ThinkPad P53s). According to the data-sheets, all of these models will be available in June. 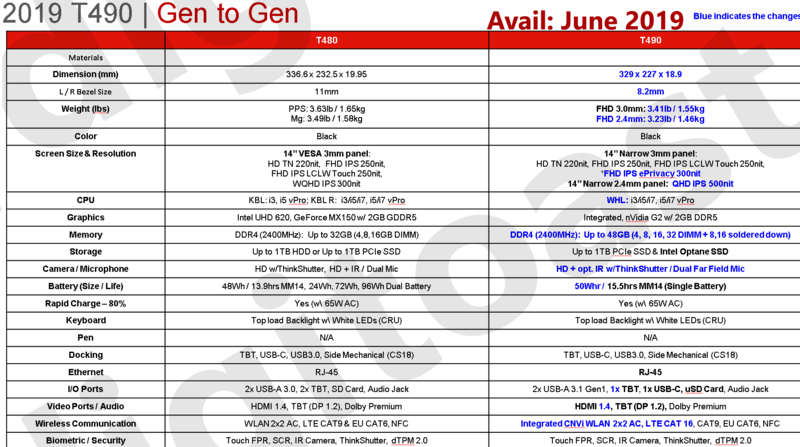 Disclaimer: We can not verify these specifications, but they do seem legit, as the leaked specs of the T490 line up with the recently announced special T490 Healthcare Edition. The ThinkPad T490s is the tenth model of the T400s series, which always was the most premium model of the T series business line. The T490s retains this role, but its completely revamped design is much closer to the X1 Carbon now compared with the ThinkPad T480s. The chassis of the T490s will be thinner than the T480s, with the thinnest-version just being 16.95 mm thick. The bezels around the screen are slightly reduced, although the difference does not appear to be huge. As the T480s, the T490s will be available in a black and a silver version, but different from the T480s, the silver version will include an aluminum lid now – the black version continues to rely on a Carbon fiber material. Another change to the outer design happens at the keyboard deck, as the T490s has a new bottom-load keyboard more tightly integrated into the palmrest. Probably even more drastically than outside changes to the design is what Lenovo is doing on the inside: Instead of having a combination of soldered RAM and a single RAM slot, the memory is all soldered now. 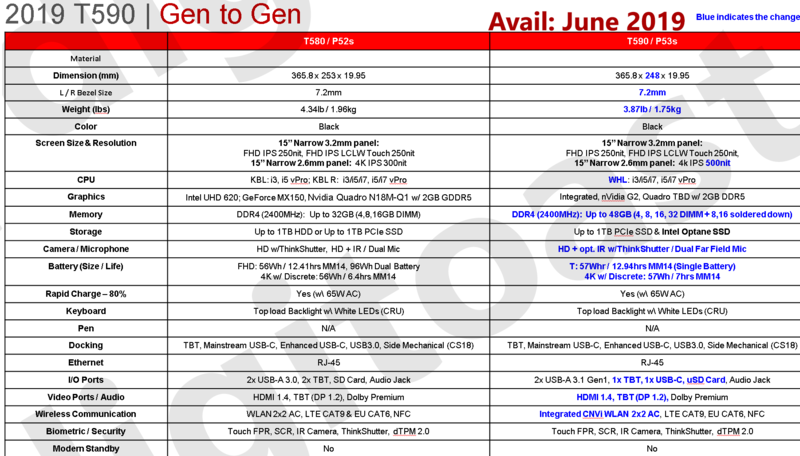 As the maximum amount of memory, Lenovo will offer 32 GB of DDR4 RAM. While the T480s had the option for a dGPU, the T490s does not offer any dedicated option. Also, Lenovo drops the full-size SD card slot for a MicroSD card reader, a trend that is happening on many laptop lines these days. Last but not least, there is no more full-size RJ45 Ethernet port on the T490s – instead, Lenovo wants its users to rely on a proprietary mini-Ethernet dongle for native Ethernet. The last area with drastic changes are the displays: Lenovo continues to offer FHD (1,920 x 1,080) IPS screens with 250 nits of brightness, but with this year update, there are a few more options: A FHD IPS ePrivacy 300 nits panel as well as an all-new low-power FHD IPS panel with 300 to 400 nits. Also, Lenovo swaps its pretty underwhelming QHD (2,560 x 1,440) 300 nit option for a 500 nit QHD screen with Dolby Vision support and 100 % AdobeRGB color gamut – it seems finally, Lenovo is putting in some better quality screens into its new T series. While the T490s moves closer towards the X1 Carbon, the T490 apparently is being moved closer to the old ThinkPad T480s design. For the successor of the "bread-and-butter" model of last years T series, the ThinkPad T480, this means a slimmer and lighter design with a loss of versatility. The T490 gets shrunk down in all dimensions: It shaves off roughly 1 mm of thickness and it is 7.6 mm less wide and 5.5 mm less tall. Naturally, this means that Lenovo also reduced the bezel size, with the bezels to the left and right of the LCD now measuring 8.2 instead of 11 mm. As important as the smaller footprint is the weight reduction, as the lightest T490 model has a starting weight of 1.46 kg (instead of 1.58 kg on the T480). While this slimming down will probably be appreciated by many users, it does have consequences, as the T490 loses some of the versatile features of the ThinkPad T480 and its predecessors. Namely, the T490 drops the 2.5 inch HDD slot as well as one of the RAM slots (instead opting for a single memory slot as well as up to 16 GB of soldered memory for a grand total of 48 GB max). Also, Lenovo swaps out the SD card slot in favor of a MicroSD card slot. The biggest change to the system is probably the death of the PowerBridge dual-battery design. The T490 contains just a single internal battery with a capacity of 50 Wh. The T480 still offered the capability to have up to 96 Wh of battery capacity with the extended external battery. As with the T490s, the ThinkPad T490 has some new screen options: Lenovo will now offer a optional FHD IPS ePrivacy panel with a brightness of 300 nits as well as a new QHD IPS panel with 500 nits of brightness. The remaining screen options (HD TN, FHD IPS Touch/non-Touch with 250 nits) were already available on the T480. Different from the T490s, the T490 will still be offered with an optional dedicated GPU by Nvidia, although the data-sheet does not specify which GPU exactly. The largest T series is much less prominent than its smaller brothers. The ThinkPad T590 is also redesigned for 2019 and the changes do mirror the T490 situation: The T590 drops some weight (1.75 instead of 1.96 kg) and its chassis is slightly less tall compared with the T580, but this also comes at the cost of the PowerBridge battery, the RAM slot and the HDD slot as well as the full-size SD card slot. The single internal battery of the T590 does offer more capacity than the T490, although the difference is not huge (57 instead of 50 Wh). Like the T490, there is a new high-res screen: A 4K panel with up to 500 nits of brightness. Unlike the T490s and T490, there will be no ePrivacy option for the T590.